Mid summer is prime time for picking raspberries. Raspberries are at their peak. 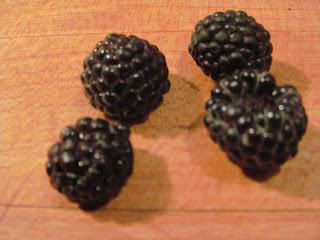 Strawberries and mulberries may have already peaked in generous harvests and blackberries and blueberries have yet to appear. Perhaps my love of raspberries comes from my mother. Her father lived next door to the Cimonetti family in Glen Cove, on Long Island. Whenever we visited, Nicky would bring over fresh raspberries, just picked that morning. While living in Bloomington, Indiana, we moved several times. My father may have made one of the moves for my mother; next door was a large garden with a healthy grove of raspberries. Other kids sneaked out at night to smoke; I was sneaked out and tried to tell the difference between ripe and hard fruit without a flashlight. In the late 1970’s and early 1980’s, someone said that a fungus was going to make the species extinct. So, when I found raspberries in a San Francisco Safeway, during a visit to friends Jim and Yvonne, I bought several pints and called my parents from the airport. Even though the traffic to JFK was horrible that day, my parents met me between planes and were happy to get the berries. In the supermarket, Driscoll’s is often the main brand of raspberries. 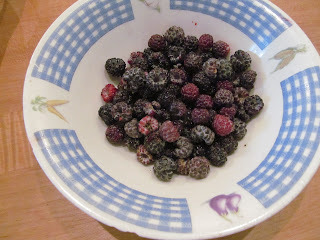 But my favorite berries are in our backyard and on the local road in front of our house. are berries that are not yet ripe. 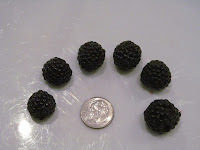 The biggest black raspberries, or black caps, as they are also called, in the backyard have a diameter no larger than a dime. According to Marvin Pritts, Chair of Cornell University’s Horticulture Department, and a raspberry fan himself, “Genetics tend to limit the size of wild black raspberries.” “Even if a person carefully tends the plants,” he continued, “they are still likely to be smaller than plants that have been bred and selected for larger fruit size.” Cornell has an excellent website with lots of information about raspberries and other appealing fruit. I have a circuit through the backyard, which hits all the berry bushes. Most of the time, my companions include many mosquitoes and flies. On a good day, half an hour will yield about a pint of berries. Black raspberries always seem to be there but they have a precarious existence. This is consistent with berry life in the neighborhood. Three years ago, there were berry bushes along the road. Rose the Dog, a white Samoyed, and I were a distinctive sight as we walked along. I would eat the higher up berries; Rose would delicately lick and nip the berries off the lower canes. These bushes are gone because of shading and my neighbor’s changed mowing pattern. But new bushes appeared in the backyard after Hurricane Irene dropped several trees. Some of the best berry patches near the house still get enough sun but are entangled in wild grape vines and goldenrod. E.B. Poling from North Carolina State states black raspberry canes live for two years. In year one, the cane grows. At the beginning of year two, the cane flowers and then fruit forms. After the berries are gone, the cane dies. In addition to the North Carolina State University website, Virginia Tech has a nice electronic page on black raspberries. 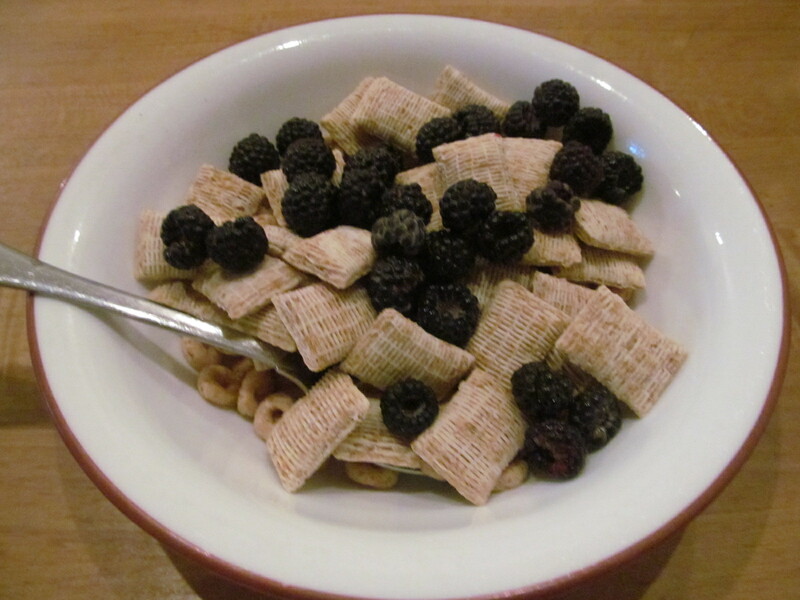 Adding black raspberries to a morning bowl of cereal or snacking on them while mowing are great treats. Whether it’s a cool day or a humid blast furnace, the sweet taste and the way each fruit is delicious yet unique, a sort of horticultural snowflake. 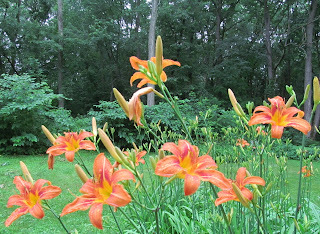 ﻿ In just the last few days, the tiger daylilies in our yard have started to bloom. The plant’s vivid orange blooms are brightening yards and roadsides on the East, West and North Coasts - - and everywhere in between. 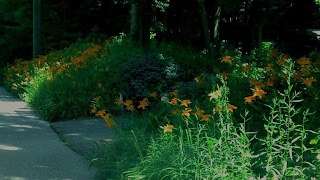 According to a blog post by James McInnis, the scientific name for the tiger daylily, Hemerocallis fulva, means “beautiful for a day.” Each bloom on the flower’s stem opens in the morning and lasts for just a day. The same flower patch on Monday July 1st! Note the wilted blooms that have already lasted for just a day. However, each stem has many blooms. A patch of the plants will bloom for several weeks. The tiger daylily came from Asia. In reading cooperative extension fact sheets found online, there is not a consensus on how the plant reached the United States. One explanation, also dismissed as a “legend,” is that the sea captains transplanted the flowers from Asia and brought them home to their wives. Another source said the plant came to the United States with English colonists. Regardless of how the tiger daylily got here, it is a vivid and delightful presence. The mass of long green leaves, topped by scores of orange flowers, is a perfect expression of the vigor and bounty of mid-summer. 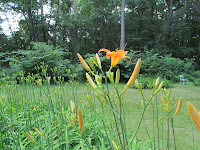 I love the orange of tiger daylily blooms. On Staten Island, we used to see the blooms on back roads throughout the Island’s pine-oak forests. The orange was an appealing contrast to the shade and forest greens. 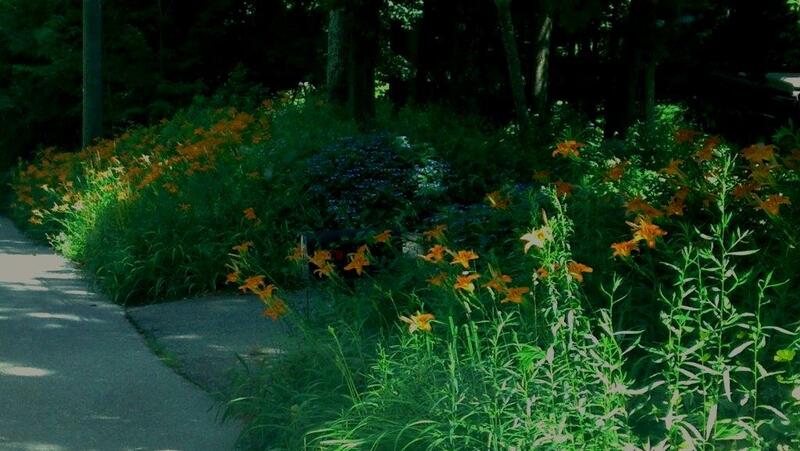 When you find daylilies on a roadside or in a remote, undeveloped place, it takes thoughts back to summers past. You might wonder what the place looked like when the flowers were first planted. You may also wonder who planted the flowers and what happened to them. Did they move West or move into a city? Tiger daylilies in Winchester, Ct. Deer will heavily graze tiger daylily shoots as the snow is melting. In Virginia, my friend Steve Jaffe finds the deer wipe out his daylilies; in my backyard, the plant grows so exuberantly that it bounces back from the deers' attentions. The vigorous growth that outlasts the deer can be a delight - - or a curse. 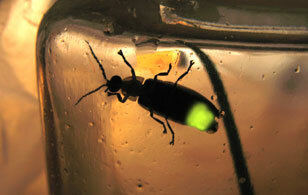 They are likely to spread rapidly and take over. Some gardeners suggest planting them in places that are not likely to be used for other plants or in poor soil where nothing else will grow. My friend, Seymour, sees flowers in Los Angeles florists that look like the tiger daylily. It also appears there are tiger daylily look-alikes that bloom longer than the original plants do - - or bloom in different colors. Long lasting lilies are beautiful. They were the main flower at our wedding and brighten up a trip trudging around the supermarket when the weather is less temperate. 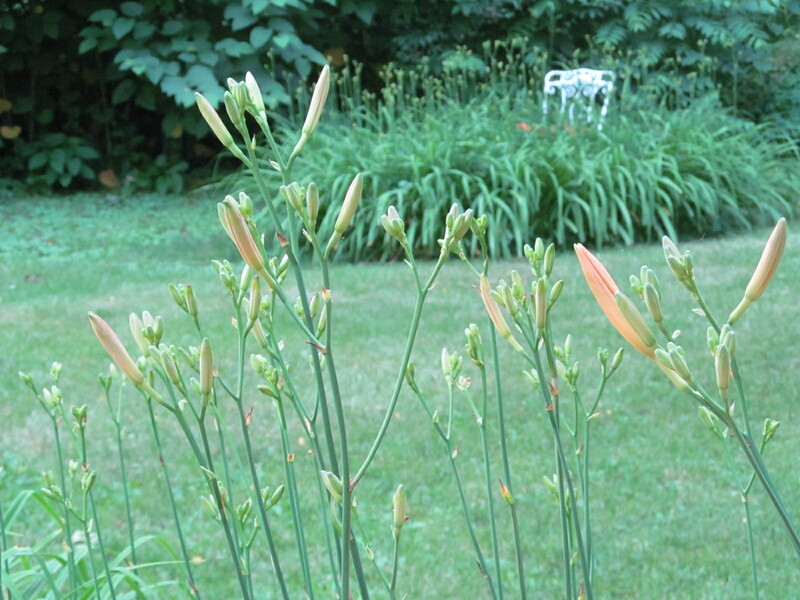 But seeing a flash of bright orange tiger lilies by the road for a week or so is an iconic view of mid-summer. It happily reminds me of my wedding and sustains me through August heat or January cold.